Comments - Handsome uncut paper model print of a scene from a kabuki play showing a guards attempting to capture a fugitive near a well. 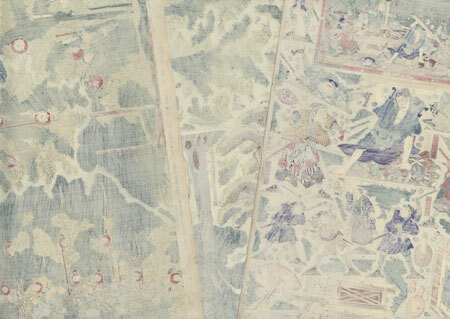 A form of omocha-e or toy prints, these entertaining woodblocks were designed to be cut apart and formed into three-dimensional models. An inset cartouche provides an example of the finished scene once assembled. Using the scene as a guide, the model builder could cut out the different components of the scene from the prints and create the model. 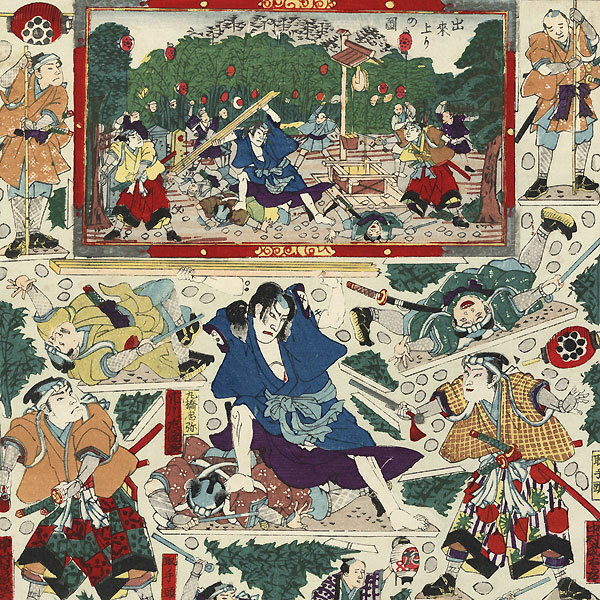 Sets usually include a variety of figures, accessories, and background elements, brightly colored and nicely detailed, with subjects ranging from kabuki plays to famous samurai battles. A rare, complete uncut set a dramatic subject. Condition - This print with excellent color and detail as shown. Three separate panels. Holes at top right corner from previous string binding, as is common with these sets. A couple small tears at edges, Slight toning, a few spots and creases. Please see photos for details. Good overall.